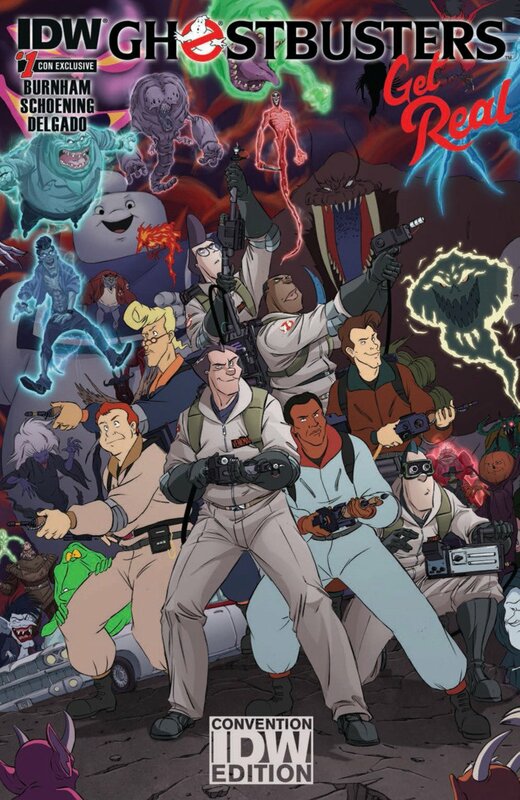 The current Ghostbusters miniseries, Ghostbusters Get Real, is already in stores and features a multiversal crossover between the film characters (which the team refers to as “Ghostbusters Prime”) and their cartoon counterparts from The Real Ghostbusters. But at the panel IDW revealed pages showcasing the event is even farther reaching. 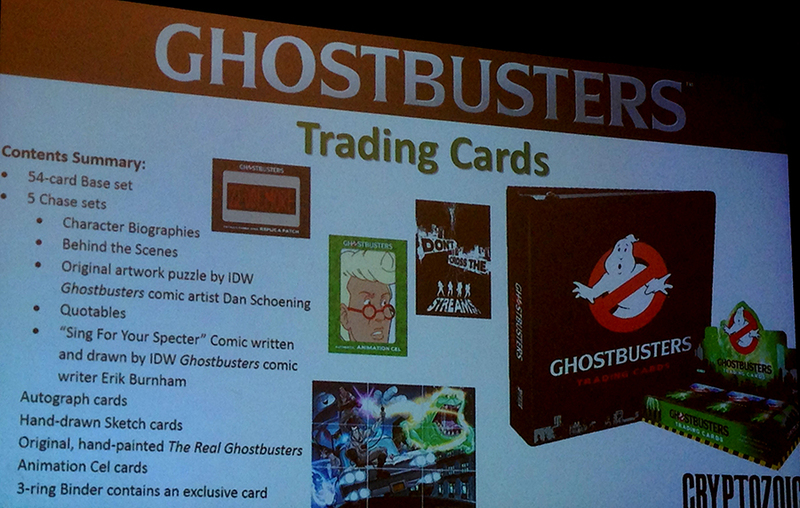 It’s not clear in what capacity they’ll be appearing, but expect to see the ghost busting teams from the animated Extreme Ghostbusters and the 2011 video game Sanctum of Slime, which IDW editor Tom Waltz wrote. The ongoing series wrapped up 2014 but the series is coming back, beginning this October with an annual that will lead into a new ongoing by the regular series creative team of Erik Burnham and Dan Schoening. The team also admitted they’d love to see the IDW series become an animated series. Turns out it’s a conversation that’s come up a few times. If fans want it enough, writing letters to Sony was encouraged. 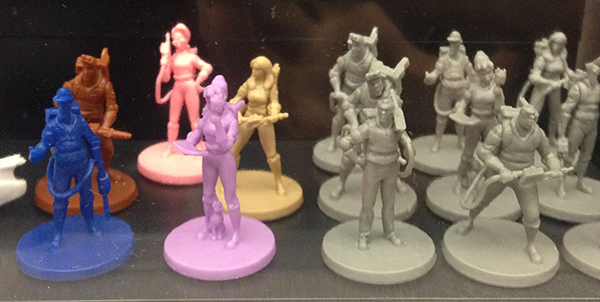 Meanwhile, Cryptozoic publicly debuted some of the super-detailed miniatures that are coming with their game as well as some unexpected merch. 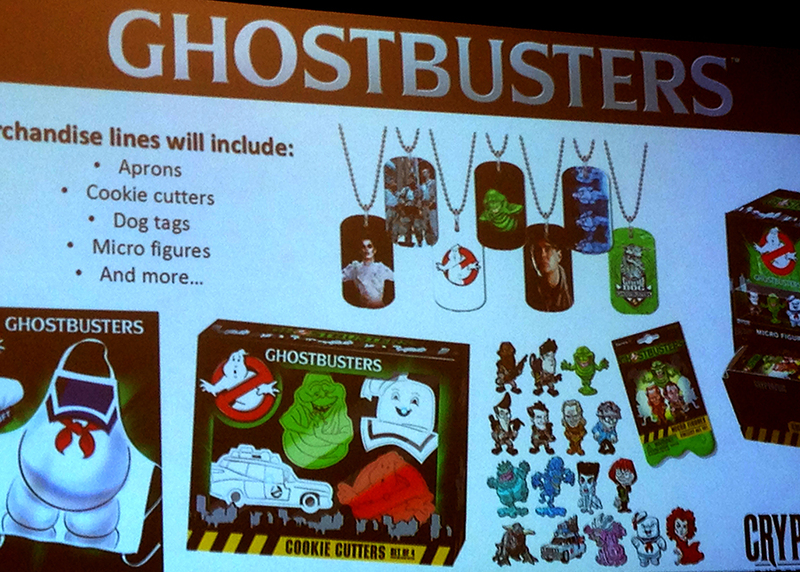 Turns out their Ghostbusters license is far-reaching and they’re not just making trading cards, but also aprons, cookie cutters, dog tags, and, most excitingly, mini figures. 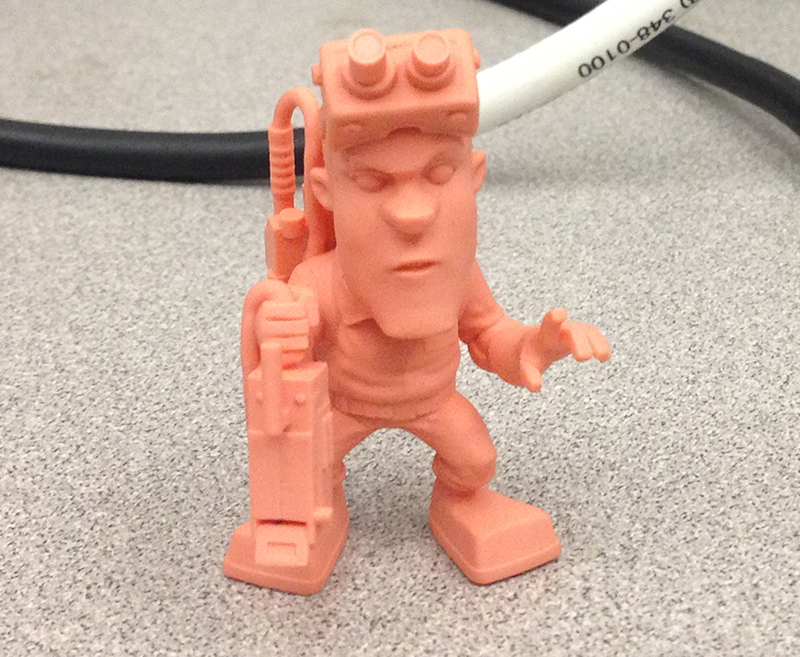 They showed off an unpainted Ray figurine. After the game releases this fall, be sure to expect expansions. The team pointed out that glaring omissions from their already extensive roster of ghosts was not by accident. (See more pictures below). Perhaps the most surprising aspect of the panel was the discussion surrounding the forthcoming Paul Feig relaunch of Ghostbusters and the additional Ghostbusters media projects Dan Aykroyd and Ivan Reitman are developing for Sony under the “Ghost Corps” banner. Waltz admitted he recently read a draft of the latest film’s script and assured the room it was everything fans would expect from a Ghostbusters story – “don’t even worry about it.” In fact, Waltz cites Burnham and Schoening’s run on Ghostbusters as a possible inspiration for Aykroyd and Reitman’s Ghost Corps. Early into the run, Nerdy Show interviewed Aykroyd and found that he didn’t know about the series, but at some point following that, artist Dan Schoening passed issues on to him and since then the books have been sighted in prominent places such as the Ghostbusters 1 & 2 Blu-Ray. Though IDW’s involvement with the new cannon of films isn’t confirmed, based on the coy nature of Waltz and the extremely close relationship they have with Sony – it seems likely something is in the works. For more ghost busting action, check out our RPG podcast series, Ghostbusters: Resurrection and join the discussion on the forthcoming film in our forums.